Cates Quick Moving, LLC is a rapidly growing, family-oriented business that is changing the standards for movers across Dallas-Fort Worth. We strive to be the best everyday and on every job. Taking care of your personal items is top priority to us. Everything is wrapped individually at no extra charge to you. We set up pads and blankets around the house to make sure no damage is done to your property. You can trust us with your most cherished items including antiques, fine art, pianos, sculptures and more! Our employees are all very polite, friendly, and fast. They work at a very quick, yet careful pace, and are also resourceful enough to get your furniture in and out of any space. These men will go above and beyond to make your moving experience as stress-free as possible. Our team will do whatever it takes to make your first night in your new place as "home-like" as possible. Hanging fine art, assembling furniture, rearranging furniture if you change your mind, it doesn't matter, we are there to make your life easier. In addition to home moves, we also handle professional home stagings. 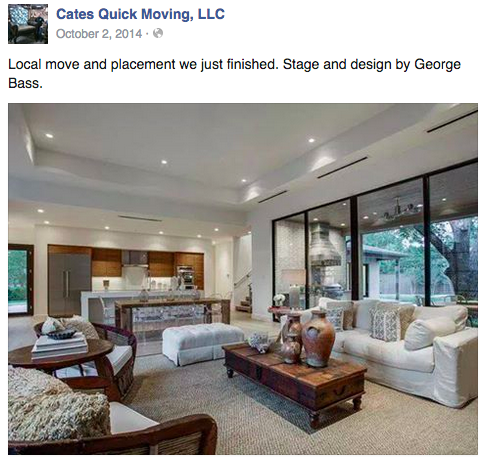 Recommended by several top designers and real estate agents in the DFW Metroplex, Cates Quick Moving has been dominating the home staging aspect of real estate. Our white glove moving service offers very competitive rates and only hire the best of the best. Available 24/7, we can accommodate almost any need you could have. Pianos: While pianos and organs can be a challenge, especially to a novice crew, we have the background, expertise, and equipment to safely transport your instruments while ensuring their safety. Our professional movers are skilled at wrapping, securing and loading your upright, baby grand, grand, spinet or other style pianos. We will carefully bubble coat and transport your piano from door to door. Nothing is left to chance and we understand how important such items are. Put our gentle, yet expert, packing and delivery to the test! 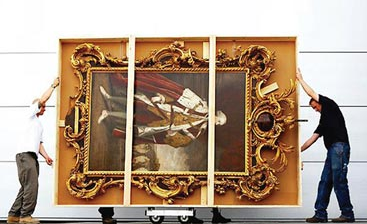 We know how valuable your fine art and antiques are, both from a financial and a sentimental standpoint. That is why our expert crew of fine art movers deliver gentle service and pay close attention to every detail through transport and delivery. 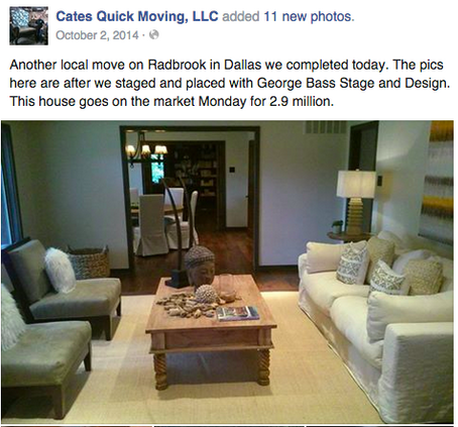 Cates Quick is trusted by many top DFW art galleries, interior designers and real estate agents for home staging as well! People always ask if our moving services extend to the suburbs outside of the DFW metroplex –the answer is yes they do! We know our sprawling home turf of Texas well. On top of our geographical reach, 3 Men Movers can be trusted to get your home moved safely and efficiently thanks to over thirty years of experience across the state and beyond. Our primary zip codes are 75205, 75225, 75230, 75229, 75214 and downtown Dallas 75201. Our main goal is ensuring that your belongings are safely moved and keeping you informed and supported during your move in and around the metroplex. We ensure that every moving crew comes prepared with bubble wrap, blankets, and floor coverings to protect your home and belongings from damages. Plus, your “Move Concierge Team” is just a call away when you have questions concerning your move, how many fine art movers can say that?